The PERK/ATF4 Branch of IERSR and Leishmania Infection: Is a Functional Role? The integrated endoplasmic reticulum stress response (IERSR) is an evolutionarily conserved adaptive mechanism that ensures endoplasmic reticulum (ER) homeostasis and cellular survival in the presence of stress including nutrient deprivation, hypoxia, and imbalance of Ca+ homeostasis, toxins, and microbial infection. Three transmembrane proteins regulate integrated signaling pathways that comprise the IERSR, namely, IRE-1 that activates XBP-1, the pancreatic ER kinase (PERK) that phosphorylates the eukaryotic translation initiation factor 2 and transcription factor 6 (ATF6). The roles of IRE-1, PERK, and ATF4 in viral and some bacterial infections are well characterized. The role of IERSR in infections by intracellular parasites is still poorly understood, although one could anticipate that IERSR may play an important role on the host’s cell response. Recently, our group reported the important aspects of XBP-1 activation in Leishmania amazonensis infection. It is, however, necessary to address the relevance of the other IERSR branches, together with the possible role of IERSR in infections by other Leishmania species, and furthermore, to pursue the possible implications in the pathogenesis and control of parasite replication in macrophages. The endoplasmic reticulum (ER) is a dynamic tubular network involved in different processes such as protein folding, lipid synthesis, and the biogenesis of autophagosomes and peroxisomes (1). When the process of protein synthesis and/or folding is disturbed, the ER induces a transcriptional program, the integrated endoplasmic reticulum stress response (IERSR), leading to the increase of ER-chaperone expression, lipid synthesis, and the induction of other sets of gene products involved in the retrograde transport and degradation of unfolded proteins (ERAD) (2). These conserved adaptive responses reduce demand on the folding capacity or ER, increase ER’s folding capacity, and clear this organelle off of unfolded proteins. However, during this process, a set of genes that also regulate the expression of cytokines and promote the resistance to oxidative stress are upregulated. The three branches that regulate the ER response are comprised by the activating transcription factor 6 (ATF6), inositol-requiring kinase 1 (IRE-1), and the protein kinase R (PKR)-like endoplasmic reticulum kinase (PERK). IRE-1 activates the X-box binding protein 1 (XBP-1), a transcriptional factor that plays a critical role in cellular homeostasis and regulates the expression of important cytokines related to the anti-viral immunity response, such as IFN1-β. PERK phosphorylates eIF2α, which reduces overall protein synthesis while upregulating the expression of activating transcription factor 4 (ATF4), which drives the expression of genes that play a critical role in restoring cellular homeostasis, resistance to oxidative stress together with genes related to the autophagic pathway and the innate immunity response. Interestingly, both XBP-1 and ATF4 can be activated by toll-like receptors (TLRs). For instance, the engagement of TLR2 and TLR4 can specifically activate XBP-1 leading to the production of pro-inflammatory cytokines that restrain bacterial burden in infected macrophages (3). ATF4 can be directly activated by the TLR4-MyD88 pathway following stimulation of human monocytes with lipopolysaccharide (LPS) (4). Viruses can selectively induce specific branches of the IERSR. For instances, human cytomegalovirus and hepatitis C activate the IERSR response, while some viruses, such as dengue virus and hepatitis C virus induce the IERSR trough the exploitation of the ER membranes during the replication process (5). Additionally, some viruses induce the IERSR and the inhibition of the translational process due to the phosphorylation of eIF2-α, reducing the production of cytokines and interfering with the host immune response. This process is highly induced by enteroviruses (6). Some viruses adapted the IERSR pathways to favor their infection directly. The phosphorylation of eIF2-α induces the translation of a specific set of proteins including ATF4. ATF4 can, for example, enhance human immunodeficiency virus (HIV) replication through a synergistic interaction with the HIV regulatory protein Tat (7). The role of IERSR pathways in parasite infection is poorly investigated. Recently, it was reported that Plasmodium berghei induces the ER stress response and XBP-1 mRNA splicing and translation of the transcriptionally active XBP-1 spliced form (XBP-1s) in hepatocytes. This activation was demonstrated to be crucial for parasite replication inside hepatocytes and to the progression of the infection (8). XBP-1s can modulate the synthesis of phospholipids, such as phosphatidylcholine (PC), in hepatocytes. PC is a major component of membranes, and it has been demonstrated that malaria parasites uptake host-derived PC and, most probably, PC is also employed for enlarging the parasitophorous vacuole membrane (9). Most recently, we showed that induction of ER stress favors Leishmania amazonensis infection in a TLR2-dependent manner, culminating in the formation of XBP-1s. XBP-1 induces IFN-β expression and modulates the oxidative response of infected macrophages, thereby promoting parasite proliferation (10). However, it will be important to test these observations in other Leishmania species and to address the relevance of the PERK/ATF4 and ATF6 branches of the IERSR during Leishmania infection. We recently observed that L. amazonensis induces the activation of XBP-1 in macrophages. RAW 264.7 cells knocked down for XBP-1 exhibited reduced parasite load, likely due to impaired translocation of the IRF3 transcription factor resulting in reduced IFN-1 expression (10). We also observed that infected XBP-1 knocked down macrophages produce higher nitric oxide levels and reduced Hemeoxygenase (HO)-1 expression compared to control macrophages. However, how XBP-1 controls oxidative stress in L. amazonensis infection requires further investigation. One mechanism that could induce this effect is the activation or repression of the NF-κB transcription factor. L amazonensis activates an NF-κB p50/p50 repressor homodimer, which promotes reduction in iNOS expression and favors parasite growth (11). The production of ROS can activate the ER stress response, which can suppress NF-κB activation in the later phase of IERSR (12). The protein A20, an ubiquitin-editing NF-κB inhibitor protein, may play an important role in this process, as this protein can negatively regulate NF-κB during oxidative stress (13). Additionally, it is important to understand if other Leishmania species induce the IERSR branches, and the role, if any, in pathogenesis. Experiments carried out by our group observed an induction of the XBP-1 spliced form in clinical samples from patients infected with Leishmania braziliensis, another Leishmania species widely found in Brazil and the main causative agent of cutaneous leishmaniasis. These data indicate that other Leishmania species can activate this pathway, and that IERSR may play a role in Leishmania-associated pathogenesis. The mechanism through which L. amazonensis induces ER stress is not understood. Leishmania parasitophorous vacuoles interact continuously with the ER compartment and may recruit components that are important for parasite intracellular survival (14). The inhibition of such membrane compartment fusion with the parasitophorous vacuole results in the reduction of infection (15). It is conceivable that such compartment fusions may favor the activation of IERSR branches in infection. The contribution of TLR receptors in IERSR remains to be elucidated. There is evidence to suggest that TLRs play a role for the success of L. amazonensis infection that is linked with IERSR activation. For instance, when TLR2 KO macrophages were treated with the ER stress inductor thapsigargin, there was a reduction of the L. amazonensis proliferation compared to wild-type cells (10). Additional results obtained by our group showed that TLR2 was partially required for XBP-1 activation (splicing) due to L. amazonensis infection. However, the mechanism by which L. amazonensis induces XBP-1 activation and ER stress remains unclear. The PERK/ATF4 branch of IERSR plays an important role in certain cellular processes that are also exploited to establish Leishmania infection. For instance, L. amazonensis induces the PI3K/AKT signaling pathway (16), and it has been reported that the PERK-eIF2α pathway and PI3K signaling increases ATF4 expression, nuclear localization, and transcriptional activity (17–19). Additionally, PERK can directly regulate the activation of the nuclear factor (erythroid-derived 2)-like 2 (NRF2), an important antioxidant transcription factor that regulates the expression of a number of antioxidative response genes (20). Additionally, ATF4 has an important role in the autophagy. PERK/eIF2α/ATF4 signaling can induce upregulation of cytoprotective autophagy genes, such as ATG5 and ATG7, which promote cellular survival (21). In addition, ATF4 controls the microtubule associated protein 1A/1B-light chain 3 (LC3) expression. LC3B is important to generate the autophagosome formation, a hallmark of the autophagic process (22, 23). In 2012, Cyrino et al. showed that Leishmania parasites induce LC3B conversion and suggested that autophagy favors L. amazonensis infection (24). ATF4 is upregulated by HIV-1 infection and enhances HIV replication, likely due to synergistic interactions with the HIV Tat protein. Importantly, the expression of ATF4 induces HIV reactivation in chronically infected cell lines (7). Recently, our group showed that the Tat viral protein also increases L. amazonensis infection, in a PKR-dependent manner (25). L. amazonensis is able to induce PKR, a pathway activated in viral infections (26). L. amazonensis can also modulate IFN-1 expression in a TLR2/PKR-dependent fashion to promote the infection by the parasite, another pathway that is shared in viral infections (27). Taken together, due to classical function of IERSR in viral infections, it is relevant to test the role of PERK/ATF4 in viral co-infection and Leishmania. It is well known that the IERSR can modulate viral and bacterial infection, promoting the induction of cytokines, including IFN-1, which can be determinant to the outcome of several infections. Recent work suggests that the IERSR is required for the development of intracellular parasites. For instance, the activation of XBP-1 in hepatocytes infected by P. berghei favor the infection by the parasite through the modulation of lipid synthesis. Corroborating this notion, it has been demonstrated that L. amazonensis activates XBP-1 leading to IFN-1 expression and the expression of antioxidative responsive genes, such as HO-1. Unveiling the mechanisms by which IERSR promote intracellular parasitic infection requires further investigation. These investigations would include determining the role of XBP-1 in resistance to oxidative stress due to Leishmania infection and examining other components of the ER stress signaling pathway, such as ATF6, in the context of parasitic infection. We can predict that the investigation of IERSR in intracellular parasitic infections may reveal novel drug targets. Figure 1 shows the a schematic model of IERSR activation in Leishmania infection. Figure 1. Schematic model of the IERSR activation during Leishmania infection. Viral, bacterial, and parasite infections can activate the IERSR. Viral infections can induce the activation of IERSR and lead to the inhibition of the translational process that suppress the viral replication. In Leishmania infection, the activation of IERSR can induce the IFN-1 production, which favors the intracellular parasite growth. Additionally, XBP1s activation is important to promote the induction of HO-1 expression, promoting the parasite infection. On the other hand, Leishmania infection can be favored by the control of the antioxidative response and induction of autophagic process. 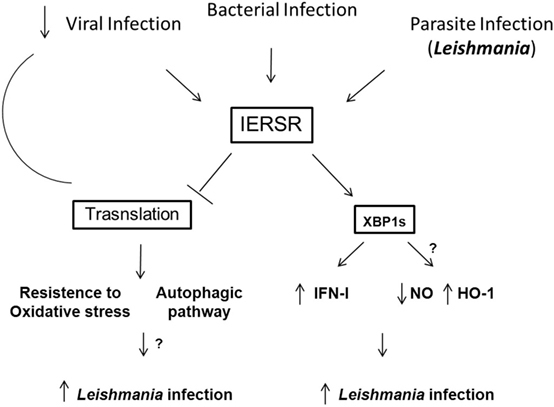 Both processes can be induced by the activation of IERSR, and we may predict that Leishmania can trigger these pathways. UL – project supervisor and wrote the paper, KD-T – performed experiments and wrote the paper, RP – revised the paper and discussed the results, JS – provided samples and supervised experiments, NF – revised the paper and contributed with the discussion, BA – supervised experiments, revised the paper, and discussed results. This work was supported by the Conselho Nacional de Desenvolvimento Científico e Tecnológico, Brazil, to UL. Copyright: © 2016 Dias-Teixeira, Pereira, Silva, Fasel, Aktas and Lopes. This is an open-access article distributed under the terms of the Creative Commons Attribution License (CC BY). The use, distribution or reproduction in other forums is permitted, provided the original author(s) or licensor are credited and that the original publication in this journal is cited, in accordance with accepted academic practice. No use, distribution or reproduction is permitted which does not comply with these terms.